How much water typically goes into washing jeans? 31.7 gallons per jean, according to New Fashion Products, our L.A. factory. How does EILEEN FISHER compare? 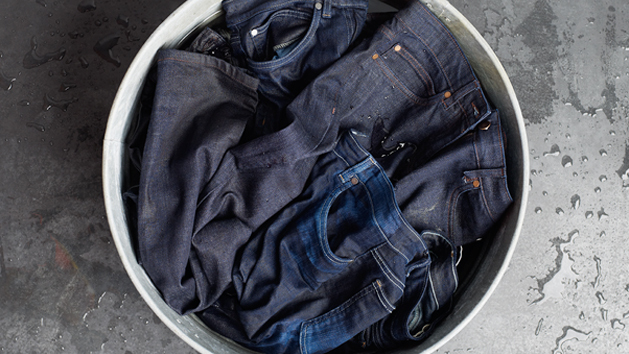 Sky Blue, our most water-intensive wash, uses 14 gallons per jean. Utility Blue and Indigo require only 5.3 gallons, or 62% less. Our jeans save water because they are minimally treated—no stone washing or chlorine bleaching. Why are jeans washed at all? Washing is what gives jeans a faded look. Here’s how it works. The fabric is dyed, and the jeans are sewn then washed (and sometimes bleached) to remove the dye and age the fabric. Instead of multiple washings, Utility Blue is broken in with hand sanding and the natural bleaching action of ozone gas. Indigo uses a simple rinse to lighten it slightly. How can I tell what my water impact is when I shop? A good rule of thumb: the lighter the denim, the more water required to get the look.